There is substantial interest in the financial technology ('FinTech') sector, at a time when the financial services sector is generally experiencing considerable churn. Several start-ups and newer companies are challenging the incumbents, using digital platforms to deliver products and services more efficiently and employing better business models. The chart below shows an overview of the top FinTech patent holders, along with their filing trends. Given that FinTech lies at the intersection of finance and technology, these are the logical axes along which to segment the patents. Some commonly accepted FinTech categories are based on the financial product or service addressed. Six of these financial categories are payments, banking, wealth management, capital markets, insurance and lending, and FinTech patents can be analysed using these categories. An alternative partitioning of FinTech patents based on the technologies covered is also useful, since it gives a different axis to view the FinTech patent superset. Some major technology categories that enable FinTech are data and analytics, the Internet of Things, mobile platforms, security, cloud computing and cryptocurrency. A matrix map of the patents along the two axes can easily locate key patent holders along each axis, as well on the intersection nodes. The numbers at each node indicate the intersection counts along with the key patent holders. Partitioning a large portfolio such as the FinTech patent set using multiple sets of criteria (eg, financial and technology categories) and identifying their interactions can be a time-consuming task without an appropriate analysis tool. However, with features such as collaborative tagging and automapping of bucketing criteria available in the present generation of IP analysis tools, large patent sets may be quickly and accurately partitioned and analysed much more quickly. Bubble proximity indicates similarity of patent portfolios, while the size indicates size of holdings. The top 10 is very different across the various lines of business. Relecura's IP intelligence report, "FinTech - An IP perspective", points to the quality of these patents. 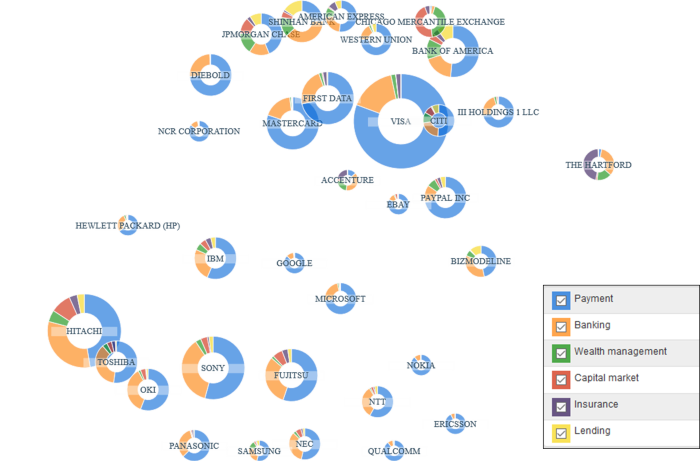 It also identifies the top companies citing patents, filing trends and heavily cited key patents. 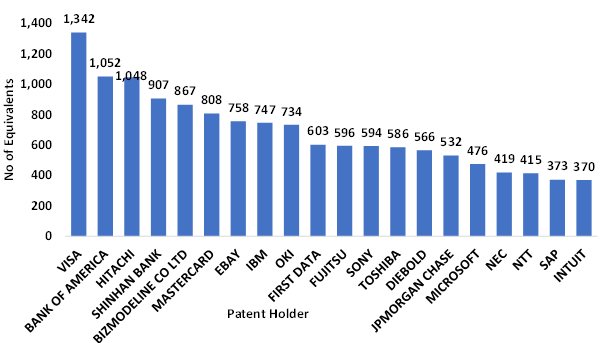 Visa, Bank of America and Hitachi, followed by Shinhan Bank and Bizmodeline, are the top FinTech patent holders. FinTech patents are distributed among a wide range of patent holders. The top 200 patent holders constitute only 39% of the total. The patent holders are from a range sectors, including pure-play FinTech or financial institutions, banks, telecoms companies, software companies, IP commercialisation entities and e-commerce firms. Fintech is an active sector in terms of both patent filings and patent transactions. Murari Venkataraman of Relecura assisted in the preparation of this article.